Pure WOD. Almost has a sort of cross-fit-y ring to it, doesn’t it? What does WOD stand for again? Workout of the day? Yeah that’s it. I’ve never actually tried crossfit. But I’m sure it does a good job. Of beefing you up. And injuring you. Lol. Ugh. Sorry I’m the worst. But. Let’s talk about Pure WOD. This bag of powder has a lot going for it. We’ll start with the most appealing part of PURE WOD, which is, ironically, it’s purity and ‘cleanliness’. 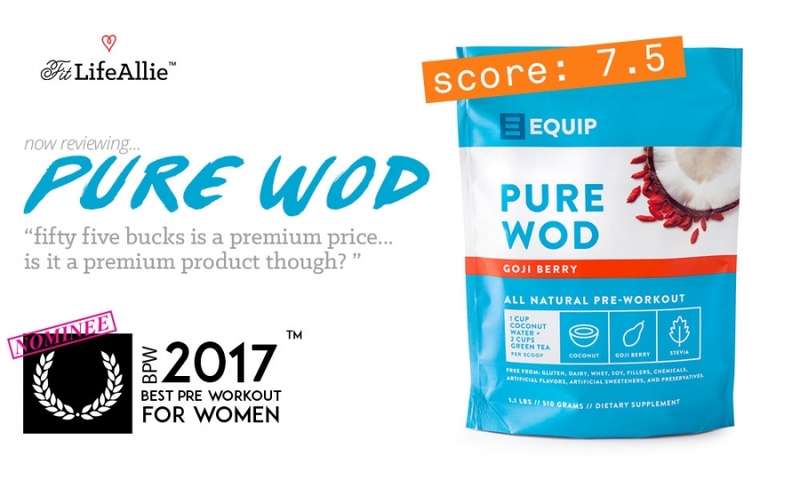 What’s in PURE WOD Pre Workout? This product has all the looks of a bag of baby diapers. You know. The kind that promises ‘non-gmo’ and ‘no chemicals’ and all of that stuff that makes you feel all warm and fuzzy inside. But what actually is inside, if not a bunch of chemicals? I mean. After all. It’s a pre workout. Pre workout is by definition a powdered chemical that you put in your body with the intent of extending your workout and shortening your life. Lol. Wow. Who would’ve thought that this pre workout would have such traditional pre workout ingredients? I was actually half expecting a bag full of dehydrated honey powder, rose hips, and basically nothing very performance-oriented at all. Turns out PURE WOD is a full-blown power-lifter pre workout. I could set a new deadlift PR with this stuff. There’s not nearly enough caffeine in here to do that. But. All things considered, I don’t mind this formulation at all. I don’t take creatine monohydrate because of how puffy it makes my face look, but, it certainly will provide for one heck of a strength workout. And it did just that. Does Equip Foods Pure WOD Work Good? Geez Allie. ‘Work good?’. How old are you again? I’m 28 thank you very much. Yeah. So be quiet. Lol. But yeah I took Pure WOD today and yesterday, both times for weightlifting. I did my upper body split yesterday, consisting of a good old-fashioned push and pull workout. I did 7 sets of DB bench paired with 7 sets of DB row. Let me tell you. I was strong AF. And swole up like a balloon. People probably thought I was trying to set some kind of mass record, or prepping for a female bodybuilding competition. I was scary big. But I did pee like 5 times within the 45 minutes I finished my workout. So. Yeah. I don’t know. It was an experience. It was more of the same today for leg day. I did heavy squats. I cranked them out. I really did. I was punishing the weights. Like. Big time. I didn’t set a PR, but if my knee was feeling even a little bit better I would’ve gone for it. Once again I didn’t love the look I get from PURE WOD because of the creatine and the citrulline malate I was totally ballooned up again. I still peed some of that water out but I still feel hella bloated. Just something to keep in mind. But PURE WOD is actually a pretty bomb pre workout in terms of the effectiveness for strength training. I can’t really speak to it from an endurance standpoint, but I bet it’s pretty darn good. But. You know what’s not good about PURE WOD? The flavor. Pure WOD Tastes like Crap. And by crap I mean stevia. Because stevia is disgusting. Does anyone else find it obnoxious that we can literally decipher hieroglyphics with the power of the supercomputers in our pockets, but yet we can’t make a low-calorie, all-natural beverage that doesn’t taste like absolute garbage? Me neither. I truly hate the way PURE WOD tastes. The Pure WOD flavor starts out okay, and then the whole flavor bottoms out entirely- giving way to terrible bitter stevia-ness. And then it just leaves that sour, dry, bitter taste coating your mouth until you put something actually good in it. Like Chipotle. Or C4. Or something. So. Yeah. I guess I have the ‘Goji Berry’ flavor, but it tastes like just a mixed berry to start and like I said, it goes south very quickly. But I suppose that just goes along with the whole natural thing. It looks okay though. PURE WOD is Packaged Appropriately. I think it really is. Like I said. Pure WOD looks like a bag of diapers. With a coconut on it. Like a coconut flavored diaper. Lol. Nah. It actually reminds me a lot of that ‘myprotein’ company that I’m annoying-ly starting to see everywhere. Oh! You know what else? Pure WOD also looks alot like a real-life manifestation of a website. Like a web programmer built a website and then went ‘file-print’, and out shot the PURE WOD baggy. Lol. I’m not a big fan of it, but I bet some folks will say it looks nice and ‘clean’. Bleh. I don’t like clean.